These techniques will help you to make the Gradle build process faster. Gradle daemon is a background process. If you use this, it might take (300-400) MB memory or more from your system. After adding the above line, try to Rebuild the project. If you get error, something like, Unable to locate a Java Runtime to invoke, very obvious solution, remove the line. The above line means, you are allowing Java compilers to have available memory up to 2 GB (2048 MB). If you do not have available memory to give out 2 GB to Java then you should not add this line. Another way to say this, If you have enough memory then you can try to tweak the settings. All the above changes to gradle.properties file can be configures globally instead of changing the settings for every individual project. Modify or create a file named gradle.properties in the following directory. Apply this option after all of your libraries are downloaded and configured correctly. Gradle try to resolve the dependencies from internet, every time we build our project. 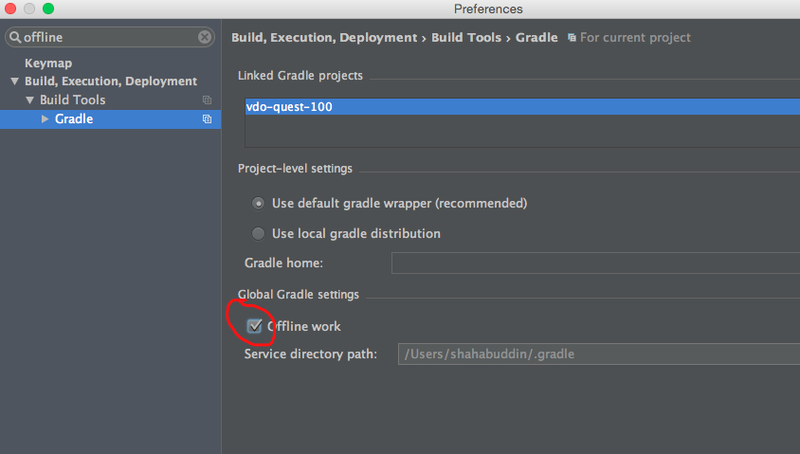 This option will force the gradle to resolve the dependencies from cache. You may need to uncheck the option if you add/modify a library. Consider using separate flavors for development and production. Try to use Gradle 2.4, it has a huge performance boost over previous versions. Enabling this could cause your builds to fail (especially on consecutive runs). If error occurs you can try to build again. Or, if it doesn’t work for you then skip it. Try not to use Build -> Rebuild Project every time to check for compile errors or after a small change. Rather use, Build -> Make Project, it is much faster than previous option.